MANHATTAN -- The NYPD and ASPCA on Friday morning rescued 10 puppies from a Lower Manhattan apartment building, where they were living in unsafe and filthy conditions. Officer Jessica Ruotolo, the precinct's ASPCA coordinator, was allowed inside the apartment on Spring Street in SoHo on February 18, when a complaint was received. After determining the conditions in the apartment were unsafe for the puppies, Ruotolo was granted a search warrant. 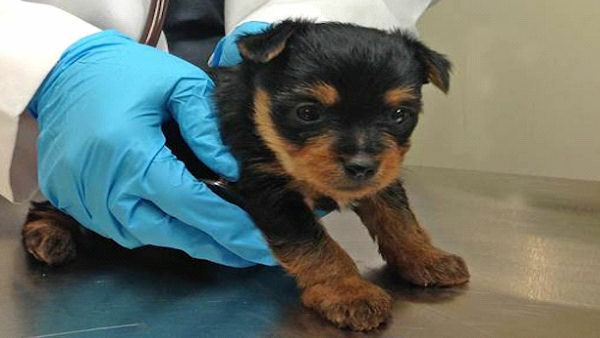 The NYPD and members of the ASPCA continued the investigation and removed the Yorkshire terriers from the building. Two people were arrested in connection with the operation, which was classified as a puppy mill. Police identified the suspects as 46-year-old Luis Sanchez and 33-year-old Xenia Torres. They face animal cruelty charges. The puppies are currently receiving medical care at the ASPCA. "This is another example of the partnership between the NYPD and the ASPCA working to rescue animals in New York City," ASPCA Anti-Cruelty Group Senior Director Howard Lawrence said. "We are hopeful that they will be healthy enough to find homes this spring." Anyone interested in adopting these puppies can call the ASPCA at 212-876-770 ext. 3800.